New, year, new Muscletech pre workout! Here is our full Neurocore review. We’re no strangers to Neurocore. We’ve been taking this micro dosed pre workout introduced by Muscletech back in 2013ish. At that time, it was a pretty big hit in stores like GNC. The formula was simple, and ‘ultra-concentrated’ mainly focusing on beta alanine, some creatine, and stimulants. Despite Neurocore’s simple nature, it still delivered some epic results compared to the competition at that time. Really, the only thing that we don’t like is the false claims in their advertising (in our opinion) which we will get to at the end of this article. Now, when you go to buy neurocore, a few things are going to be different. We don’t expect you to notice it all that much as the yohimbe ‘essence’ of Neurocore is still present. 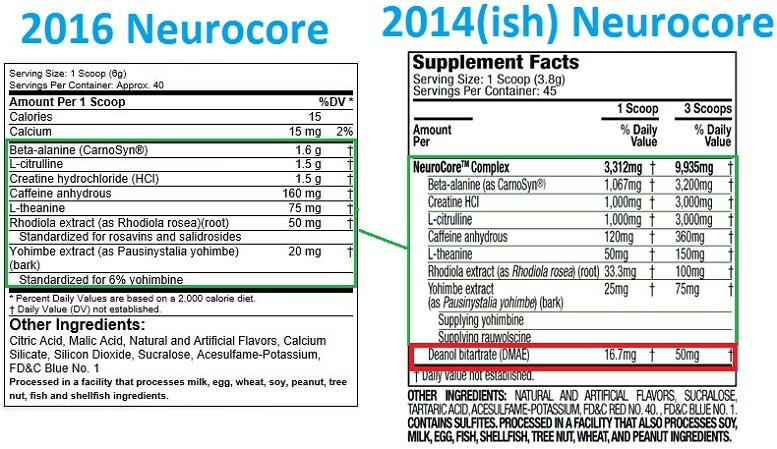 The new Neurocore does not contain the stimulant DMAE. The new Neurocore contains 5 mg more Yohimbe per single serving. However, depending on concentration of the old version, total yohimbine may be the same. All other ingredients got a slight quantity boost. With that quantity boost per serving, the standard servings by bottle went down from 45 to 33. You can see all of the differences between the new Neurocore and old Neurocore below. Note: the 2016 reformulation still stands (12/2/2018). The only difference is that the common day Neurocore contains only 33 servings, while the image label taken above displays 40. 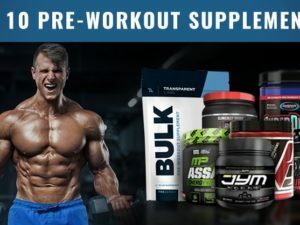 How is Neurocore in the Gym? Even with the yohimbe, Neurocore is a mild-stimulant pre workout. That means, your going to get a good energy boost with focus, but your not going to be going HAM raging out set after set. When we took neurocore, even at single servings, we felt the beta-alanine tingles. This is a good quality sign as Neurocore only contains 1.6 grams of beta-alanine per serving. 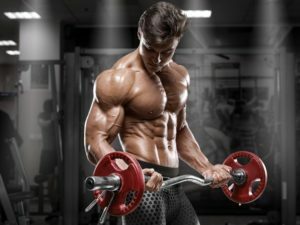 If you are looking for a true clinical dose of beta-alanine, your going to need to take 2 servings and a bit more to reach 3.5+ grams – like we talk about in our beta-alanine supplement guide. Strength wise, neurocore didn’t increase sheer power for us. But, the energy was noteworthy and people new to pre workouts are really going to like that aspect. Shatter SX-7 is Muscletech’s other small serving pre workout. So in total, Muscletech has Neurocore, Shatter-SX7, Anarchy and Nano Vapor. 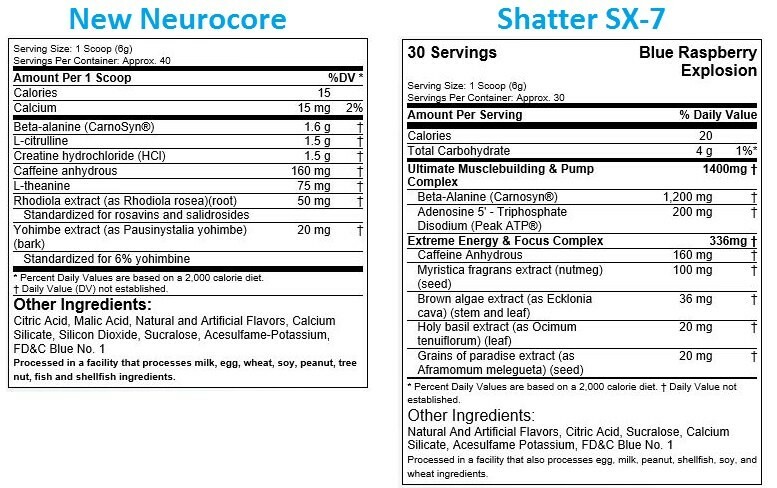 Both neurocore and shatter sx-7 have similar caffeine quanities, but practically everything else is different between these two small dose pre workouts. at least ingredient wise that is. Both of these pre workouts are energy-focused. Meaning, they really don’t contain any muscle building, recovery, or endurance ingredients. Both however are effective at increasing energy and stimulating some fat metabolism. If you would like to learn more about Shatter SX-7, you can view our Muscletech Shatter SX-7 Review here. Pulling it all together, Neurocore is a decent mild-energy small-dosed pre workout that can compete with the likes of cellucor C4. However, we are not very happy with the claims they make on their website. L-Citrulline Dosage: As you can see, they claim that 2 servings of Neurocore produces a scientifically proven dose of 3 grams l-citrulline. They then link to this study. In that study, they used SIX GRAMS of L-citrulline, and, found that lesser dosages didn’t produce results. 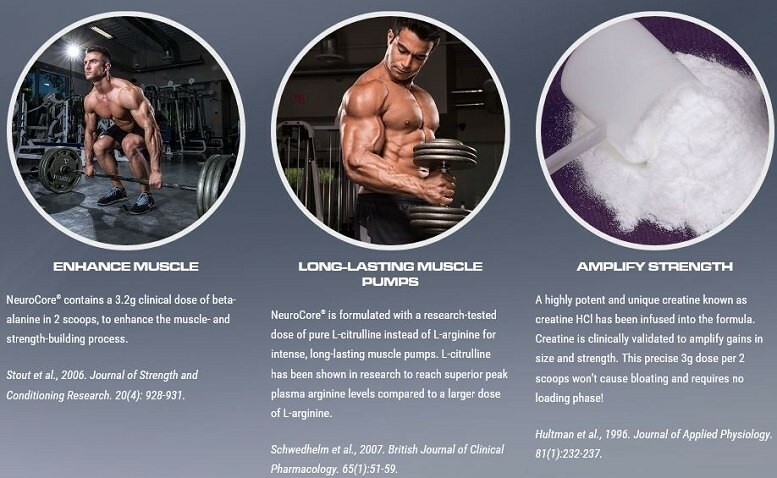 While taking Neurocore, we really didn’t have a pump, 2X demoting their ‘long-lasting muscle pumps’ claim. So in conclusion, Neurocore offers a good stimulant one-two punch with caffeine + yohimbe that the not-too-crazy stimulant lover will really appreciate. Strength wise, we didn’t notice much, but it does contain creatine HCL which is the premier pre-workout creatine choice. For the not-so-picky, Neurocore is going to be a powerful asset in the gym for increasing your energy levels. However if you scrutinize the supplement industry and want only the best supplements, Neurocore likely isn’t what you’re after. Let us know what you think about Neurocore at the bottom of this article!